A tin of tuna fish is an amazing thing. On it’s own it is bland and dry and not very appetising at all, but it’s what you can do to it that turns it into something eye-wateringly delicious. Ok, so perhaps that’s a little bit of an oversell, but there are so many ways to eat it that one can’t possibly ever get bored. Tuna is what is termed a “fatty fish” – sounds awful, but it is actually an extremely healthy fish meat and gives our bodies some of the Omega-3 that either can’t be found or is only found in extremely limited quantities in other foods. “Omega-3 fatty acids are a type of unsaturated fatty acid that may reduce inflammation throughout the body. Inflammation in the body can damage your blood vessels and lead to heart disease. My family love red meat, so an easy way to get a healthy dose of fish into our diets is to have the servings as part of our lunches. I normally serve up at least one evening meal of fish a week, but having tuna and/or smoked salmon at least once a week on sandwiches or in wraps makes me feel like I’m doing that little bit extra to keep my family healthy. This is a relatively plain mixture, only adding mayonnaise to the flaked tuna along with a little seasoning, but the crunch of the salad leaves and a little juice from the small chunks of tomato here and there makes for a very pleasant light lunch indeed. If you’re worried about the wraps unwrapping themselves, cut the wraps in half and tie a little string around each half once rolled up and secure it with a bow. It looks sweet and is a lot easier to eat, especially for little hands. They then just discard the string, leaving it in the lunch box. I try to be a responsible consumer and purchase the fish caught by pole and line instead of the massive fishing nets used by some; and minimises the impact on the environment and other marine life. It costs a slight bit more, and perhaps I’m being fooled, but at least I feel like every little bit that each of us can do helps our environment. Drain the tuna and empty it into a bowl. Add the mayonnaise and stir to combine. Dice the tomato and add to the tuna mayonnaise, along with a little seasoning. Taste it to check. 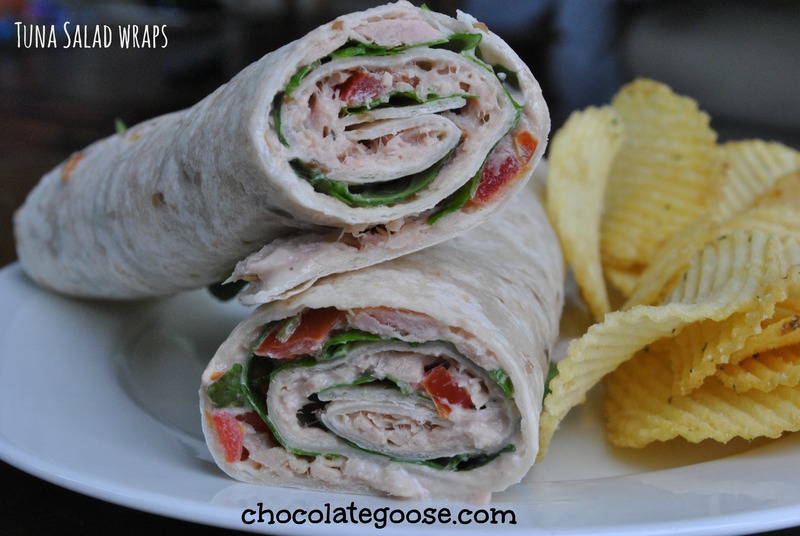 Divide the mixture between the three wraps and spread it out evenly, covering the entire area. Layer with the salad leaves and roll the wraps up carefully and evenly. Cut in half so they are easier to handle and tie with a piece of string or stick a toothpick through it to keep it closed. It will still be lovely and fresh at lunch time. If we’re having this on a weekend as a light lunch, I like to add a few salty crisps on the side.